They have their second chance; they have their family, love and whole life ahead of them. With a new found sense of purpose, Declan is determined to show the world; Alyssa and Phoebe are his future. When his past faces him head on, can he fight the knee jerk reactions and strive to be the ultimate better man? My love for Declan Reede I honestly didn’t think could become any bigger than it already was. 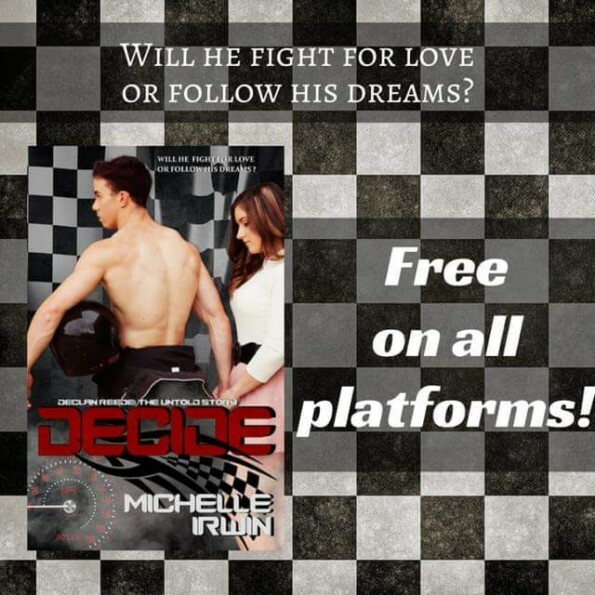 Michelle Irwin has given us the sweet, loyal, honest, smart and family orientated young man we could see and fell in love with in Decide book #0.5 in the series. The boy that was desperate to show the world how much love he had to give and to live it with the only girl he loved before outside influences changed their lives and tore them apart. I feel all soppy and mushy with this book; the love pours from the pages and you can’t help finding yourself whipped into the whirlwind that is Declan Reede. This man has changed and found himself again and along with it he has changed the lives of those around him. He has taken on his mistakes, he has taken on board what he needs to do to have the future they all deserve and he is fighting tooth and nail to have it. Nothing will stand in his way from showing the woman he loves how much she and his daughter mean to him. Alyssa really grew on me in this book, in the first two books of the series #0.5 and #1 I felt she never took any responsibility herself for how some of their future had panned out, as much as Declan had made huge mistakes and it took him a long time to realise them, she too had not given him the full support he so desperately needed to support him in both a career and a family. She is now a much stronger woman willing to strive not only for her dreams but for those of Declan’s too and she has a lot more trust in him than she has ever shown before. I had a renewed love and admiration for her. I never stopped gushing over Declan in this book; he was just so irresistibly sweet. In every task he took on he did it with a new found pride and reason to come out on top. He realised, that although family was all he needed he still wanted to strive to do well for them, which meant changing the manner in which he dealt with situations and opportunities. He was now a man, a family man and he was a proud man who had the only two people he needed, Alyssa and Phoebe. This book was gripping; on more than one occasion Michelle Irwin had my heart in my throat. Nothing in life ever comes easy and Declan’s road to where he wanted to be was far from smooth. The emotions that he and those around him went through had me close to tears. I read with abated breath and with my mind in turmoil as to where this story would go and how it would end. The bumps along the road were not all small; Declan, his family and his friends were truly put through the wringer. One character really boiled my blood in this book, I would have loved nothing more than to crawl into my kindle and have given them a taste of their own medicine; to torture them till they begged for mercy. They really did boil my blood that much. This book for me was the perfect ending for Declan and Alyssa. They deserved their HEA and they deserved a life together. I am truly made up that my racing man got his girl. 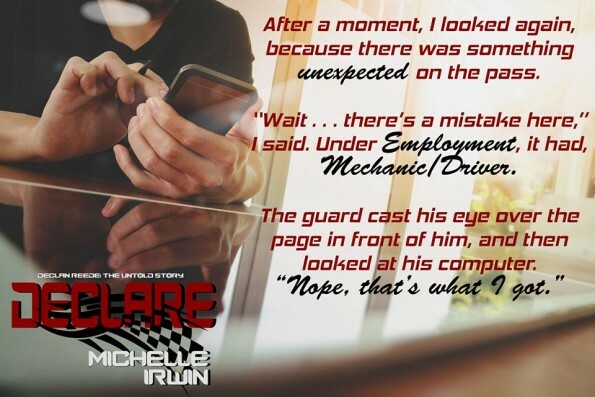 This story gives everyone hope, that when life throws a second chance at you, you take it and you prove you are worthy of it, that no matter your past you can change and have a happy future and rebuild trust and love that had once been torn away. The Declan Reede series is a contemporary romance full of suspense, heartache, humour, action and love. If you love all of these things you will absolutely love this series from Michelle Irwin. Grab the first two books in the series for FREE!! !